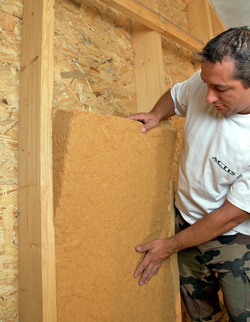 Insulation works by slowing the movement of heat from a hot space to one that is cool. Heat moves in three ways: radiation, conduction and convection. Radiation is heat transfer through electromagnetic light waves that we can't see. You feel radiant heat from a burning fire or from sunlight streaming into a window that strikes your body. In the winter, warm objects in your home can radiate heat directly through glass to the outdoors unless you have special Low-E glass that blocks this infrared energy. Conduction heat transfer happens when heat moves through an object. The heat excites the molecules in a heated object and these molecules excite the ones next to them. The closer packed the molecules are in an object, the more rapid the heat transfer. A great example of conduction is a cool spoon that is placed in a hot bowl of soup. Within a few minutes the end of the spoon not immersed in the soup will be warm or hot to the touch. Convection heat transfer happens when a fluid such as air or water gets heated by a hot object that touches the air or water. Forced air furnaces are great examples of convection heat as the air moving over the heat exchanger gets warm and then passes that warmth to objects it touches once it is in the room. 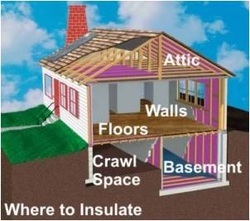 Important to take into consideration in deciding which insulation material to use. This material usually needs to be treated with chemicals to prevent mite infestation and reduce fire risk, although some natural builders use it untreated with success. 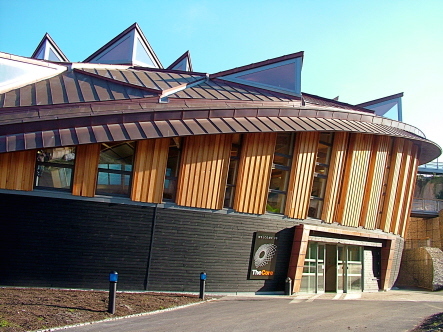 It has very low embodied energy (unless it is imported) and performs exceptionally well as an insulation material. 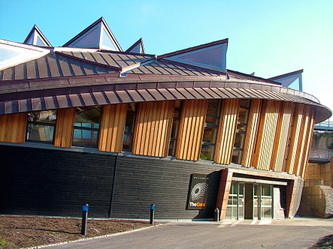 It is a building technique that uses straw bales (or even hay bales) for walls – which can be load-bearing, or used to infill a timber frame. 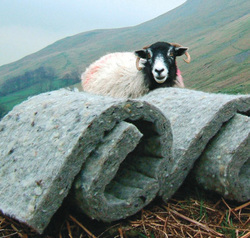 Cellulose is sustainable as it is made from recycled newspaper, preventing it from going to landfill. It is blown into place tightly filling all voids, creating an airtight space making it very efficient with it exceeding U Value regulations. 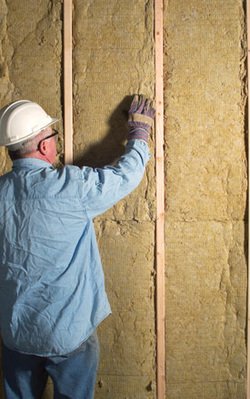 Cellulose is also available as dry loose fill, wet spray fill, stabilised, which reduces settling, and low dust cellulose. You have to wait for the wet spray to dry out fully before finishing the walls off. Structure is set into a slope or hill side. 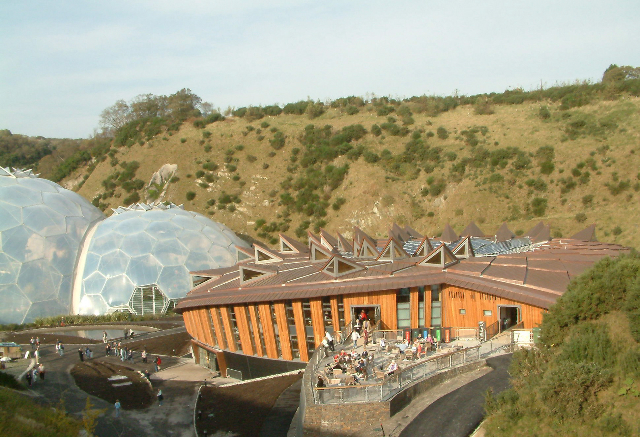 The most practical application is in a hill facing towards the equator. There is only one exposed wall. ground is excavated and the structure is set below ground. Often includes an atrium in the middle of the structure to provide adequate light and ventilation. May cause electrical safety hazards if the foil layer comes into contact with faulty wiring. These are generally polystyrene blocks that lock together without the need for mortar. 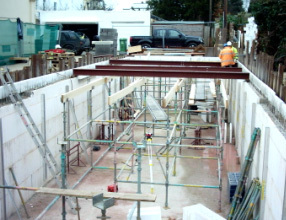 A building form, straight or curved, can be quickly built which is then filled with concrete. 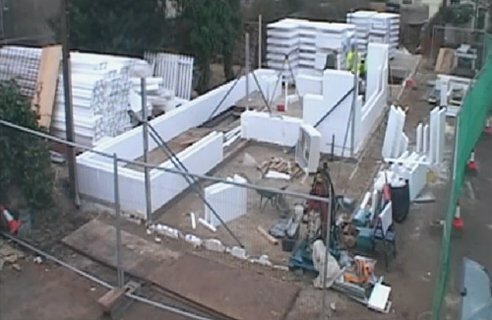 ICF's are a highly efficient method of insulating concrete with them exceeding U Value regulations. 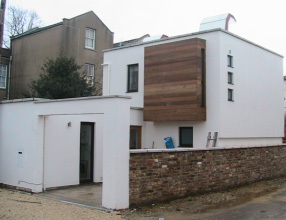 They have been used on a variety of projects in the UK some of which can be viewed at http://www.polysteel.co.uk/gallery.php?id=9 some images of Cheltenham house, as seen on Grand Designs, are shown to the right. 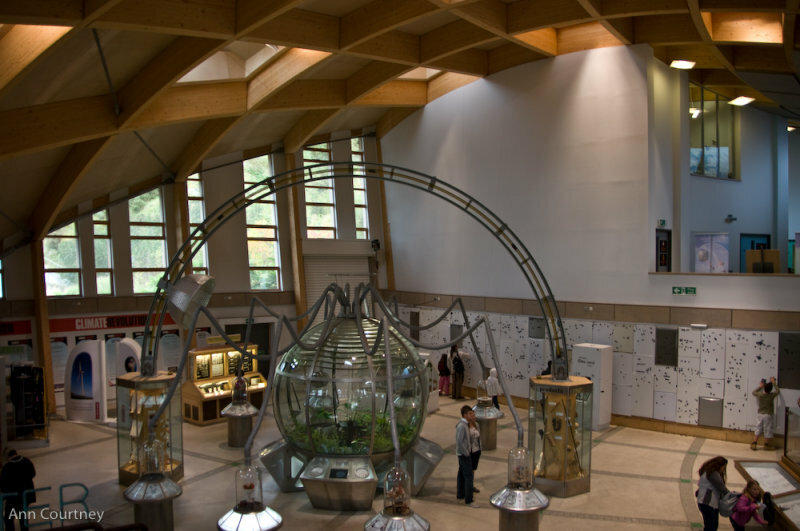 Combines several components of a traditional frame structure: studs; joists; insulation; vapour barrier; air barrier. Material cost is higher than other more conventional structural and insulative materials. Plastic Fiber: usually formed from recycled plastic, does not cause irritation unlike other types but is more difficult to cut. Flammable but is treated with a flame retardant. Formed from two separate components which come into contact upon application react to form an expanding foam. 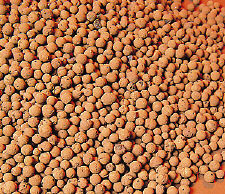 Applied directly onto the wall cavities of an unfinished wall or via holes drilled into sheathing or drywall. 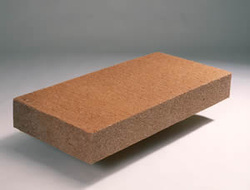 Rigid insulation board, that is usually faced with foil, that can be used in flat roofs, pitched roofs, cavity walls, as under floor insulation and in composite panels. It can also be combined with plasterboard to create an insulated wall panel. Rigid boards are available in different materials such as polyurethane, polyisocyanurate and cellular glass. The picture shows how you can combine rigid insulation with fibreglass to create a high R value.